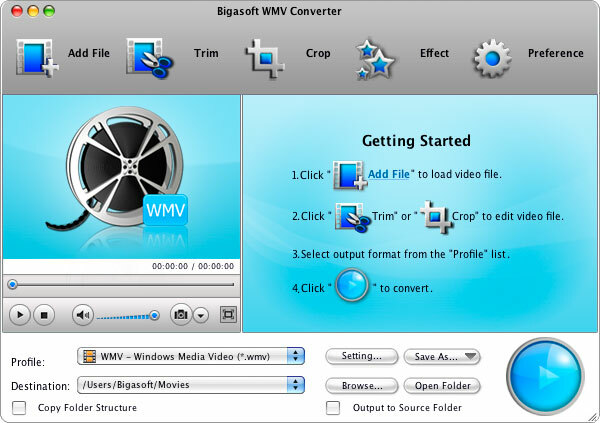 Bigasoft WMV Converter for Mac is must-have WMV video converter software for Mac if you own Microsoft portable devices, mobile phone or if you have the needs of converting videos and audio for playback with Windows Media Players, convert iMovie video and Final Cut video to WMV, HD WMV video. 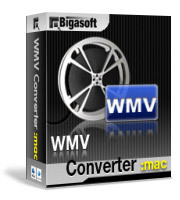 Bigasoft Mac WMV Converter can easily convert video to WMV, HD WMV, WMA, MP3 such as convert MP4 to WMV, convert AVI to WMV, convert MOV to WMV, convert FLV to WMV and convert any other format videos to WMV, HD WMV including MPEG-1, MPEG-2, RM, RMB, DivX, XviD, 3GP, MTV, WebM, VP8, VOB, MKV, HD AVI, HD MP4 and HD-Camera Videos like AVCHD, MPEG-2 HD, AVI HD, TOD/MOD, M2TS/MTS, YouTube videos and many more. 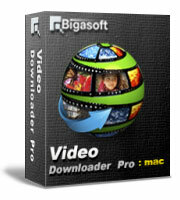 Bigasoft WMV Converter for Mac also enables you to convert WMV, HD WMV to any desired video formats. With Bigasoft Mac WMV Converter, you can enjoy unlimited movies, unlimited high definition movies in WMV on a bulk of portable devices, mobile phones, media players including PS3, Zune, Zune 2, Archos, Creative Zen, Xbox 360, Dell Players, HP iPAD, Gphone, BlackBerry, Palm Pre. What's more, the WMV Converter for Mac is powered with advanced features like video trim, video crop, merge several files into one, add water mark, and adjust brightness, contrast and saturation to output video. With the Mac WMV Video Converter, you can customize your videos freely, easily and effectively. Free download Bigasoft WMV Converter for Mac, convert and enjoy high quality movies right now! 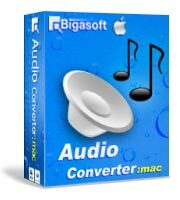 Ready to try or buy Bigasoft WMV Converter for Mac? Mac WMV Converter for Mac can helps to convert recorded video in any formats to WMV, HD WMV with few video data loss. Bigasoft Mac WMV conversion software outputs preset profiles for general WMV video, general HD WMV video, and for PS3, Zune, Zune 2, Archos, Creative Zen, Xbox 360, Dell Players, HP iPAD, Gphone, BlackBerry, and Palm Pre. * Support output video to source folder for easily find converted videos. Preview videos and take snapshot. The WMV film converter for Mac is also a WMV player on Mac which can play WMV videos wonderfully on Mac and allow you take pictures from favorite videos. Mac WMV movie converter is so easy to use and you shall never worry even you are a new user. The software will guide you to fulfill your task in few steps. If you have large files, set "Shut down Computer" action on, and the considerate app will shut your pc automatically when conversion is finished. Bigasoft Mac WMV movie converter is available around the world. It provides interface language in English, German, French, Italian, Spanish, Chinese and Japanese. Bigasoft WMV Converter software for Mac is fully compatible with Mac OS X 10.9(Mavericks), Mac OX S 10.8(Mountain Lion), Mac OS X 10.7 (Lion), Mac OS X 10.6 (Snow Leopard), Mac OS X 10.5(Leopard) and Mac OS X 10.4(Tiger).